Months ago, game designer Jeff Horger put out a call for playtesters for a Manouevre expansion. I immediately signed up. Not only is Manoeuvre one of my favorite games it would also give me a small glimpse into how a game gets made. Now that Distant Lands is on the P500 list I can finally talk about my experience. One of the reasons I signed up was to get a feel for what goes on with making games. I was sent a bunch of files that contained the rules and components for the Japanese army. The first thing I did was look through the rules and immediately had some questions. The new rules were pretty straightforward, but I wanted some clarifications. My other concern was with some of the components. These don't look like the originals. These are what I'm used to. The new maps used completely different graphics and the units didn’t have the infantry and calvalry symbols on them. Instead they had a single box white box to represent infantry while two boxes represented cavalry. You’ll notice the Japanses don’t have any cavalry. The response I got back on the new map graphics were that he had been using the different graphics for many years and that “[he was] so used to it [he] didn’t think twice about it.” I think this is one part of game design that is key: have several people that are not familiar with the game and components play it. They will point out mistakes and missing information very quickly. 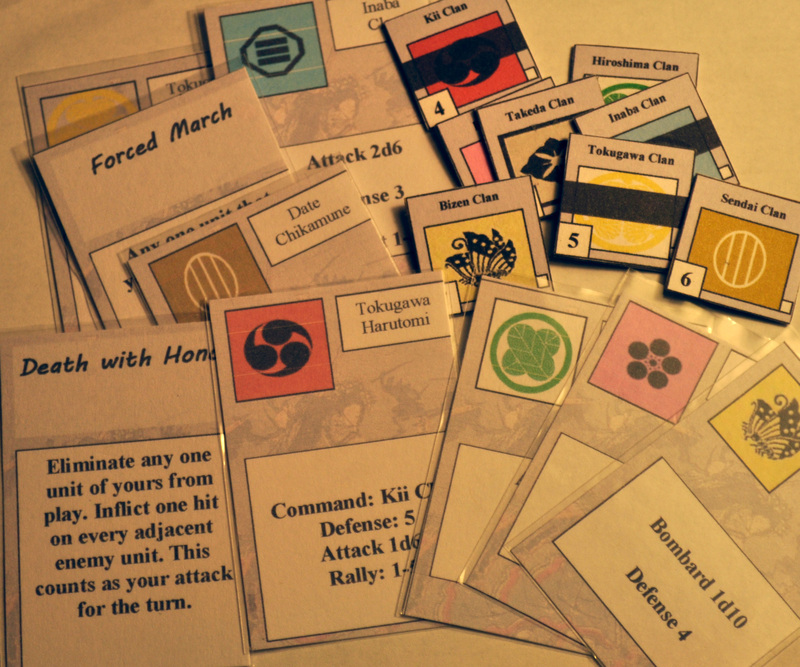 I then printed and cut out the units and cards. I was thankful for my wife’s scrapbooking supplies which I used to adhere the units to some chipboard. Then I sleeved all the cards. Plain pieces of paper in card sleeves worked very well for the small size of these cards. The components I made turned out pretty well. I should note that I changed the colors of the cards to use less ink for printing. I would assume the final components look much more like the original game. Once all of that stuff was out of the way it was time to play. I tend to like expansions for games – they can breath new life into a game that hasn’t made it to the table in a while. Or in the case of the Distant Lands, they can force you to rethink your best strategies. My wife and I sat down for our first game and both instantly liked the new rule: Advance to Contact. In your first turn of the game you are allowed to move up to 3 different units, in the 2nd turn you can move 2 units. After that it’s back to normal. This change gets both players engaged much more quickly. 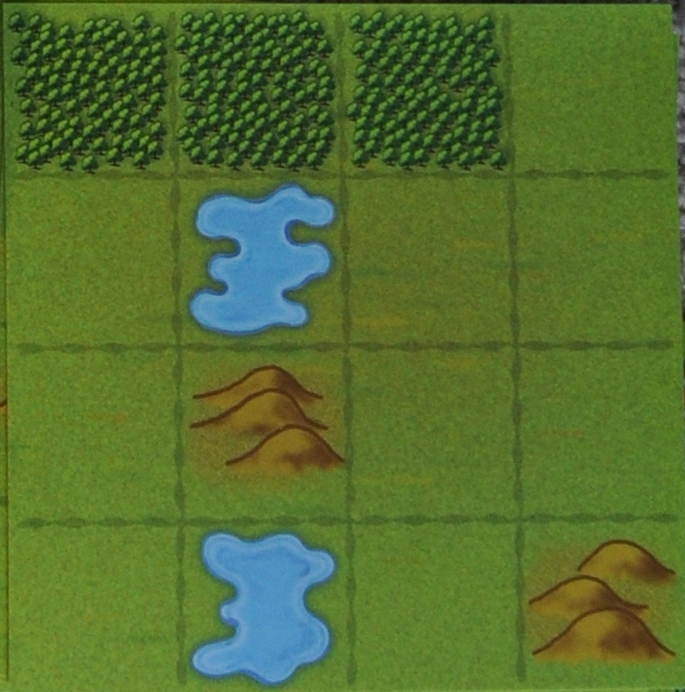 The two Japanese map tiles contained more marsh and lake features. The new ‘cluttered’ maps helped to slow down cavalry. The Japanese units were mostly unaffected by this. I’m curious to see just how many new map tiles come with this expansion. Although the base game already has enough for 6 simultaneous games. Two things will stand out right away: eight leaders and the Death with Honor cards. The Death with Honor cards allow you to eliminate a unit and then inflict hits on every adjacent unit. Normally in Manouevre you try to surround a unit to eliminate it more easily. Now if you play against the Japanese you have to be careful that surrounding a unit isn’t exactly what your opponent wants you to do. I my games I usually only used one of these cards. Inflicting up to 4 hits can be powerful but losing a unit isn’t a decision to take lightly. The leader and unit cards also act slightly differently. The other armies work together to drive their opponents back. However, each Japanese unit is self contained. They each get 2 normal attack cards and their bombard. They also get a volley only card and an attack card with a pursuit roll. 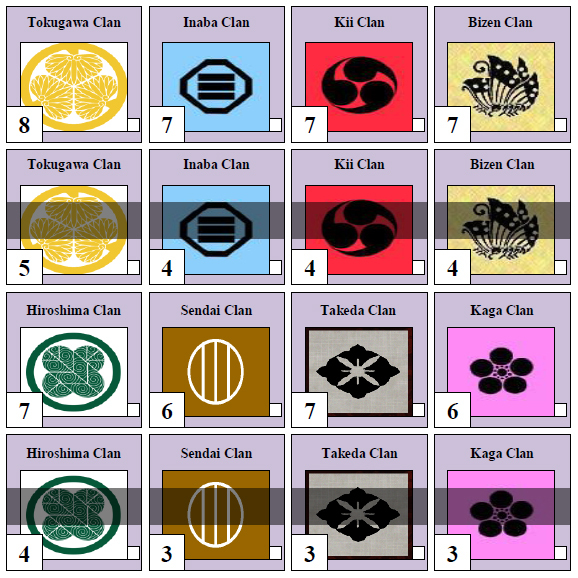 These five cards are supposed to represent the “samurai, ashigaru, cavalry, artillery and teppo” in each of the clans. The 6th card for each unit is actually a leader. The leaders for the Japanese can only command the 1 unit they lead. Only one of the leaders, the Shogun, can unite up to four of the clans. Although the units start at fairly high strengths of 6, 7 and 8, the Japanese are weaker than the other nations because of their deck. A handful cards containing a leader and a few different unit cards for most armies was quite useful – with Japan it was a disadvantage. The strength with the Japanese was keeping the units somewhat isolated. It allowed you to march single units to your opponents side of the board. Each unit was self contained. I cycled through my deck quickly while building up attacks with each unit separately. If things started to get bad for a particular unit I would sacrifice them while doling out hits. Overall I really had a good experience. It got me really excited about the new armies for Manoeuvre (Chinese combat rockets!). I am also proud to have been able to help out in the creation of what I’m sure will be a successful expansion. I was a bit overwhelmed at just what has to go into making a game – and this was just an expansion! The amount of time and thought that has to go into creating a set of rules and components is massive. And then the refinement after playtesting… But it certainly gave me a jolt to get working on my own game ideas. In the tournament scenario of Manoeuvre, the players each pick their starting hand of 5 cards. I had never really given much thought to what kind of strategy to use until our recent Toeurnament. I had tried a couple of things in my games and I’ll share some of my thoughts on those as well as some others that I saw in this BoardGameGeek.com post started by Joe. In this start you pick out your Forced March, Supply and Withdraw cards to quickly move multiple units. Choosing this starting hand will really depend on the battle field. If there are some key defensive strongholds to grab quickly it could be useful to move in fast. However, Supply cards are very valuable with their dual use so I would choose to save these for later in the game. Playing this against the fast Ottoman cavalry it may not be as effective. In this start you select the bombard cards which generally have the strongest defenses for the units. This hand allows you to move your troops into position while fending off your opponents attacks. If combined with some of the mobility cards above or a Redoubt it could be quite effective in securing those towns and hills. This type of play will force your opponent to wait until he can coordinate his attacks better. If you can play the rest of the game holding on to those spots and disrupting your opponents ability to make a coordinated attack you could really frustrate your opponent. I initially didn’t give this strategy much credit, but the more I think about it the more I like it. I will definitely give this one a shot. The strategy with this card selection is to take all 5 unit cards for the weakest unit and immediately discard them. This is a way to cull your deck of all the cards from that weak unit you planned on leaving behind. I like this strategy if you know your opponent tends to cycle through their deck slowly. Anything you can do to use your big cards, reshuffle quickly and use them again is to your benefit. The downside is you may be giving your opponent an easy kill. However, I think it’s a good trade-off. Similar to the strategy above, but instead of discarding the cards you use them. This could be done with any unit. You push that unit out front right away to and use all their cards in one strong blow. If this is a strong enough attack you can take out a unit right away and make 5 cards in their deck worthless. This is a little hard to pull off as you are relying on the luck of the die. I actually like a slightly different approach of using them all on the defense. Causing hits against your opponent on their turn. Ideally you would follow it up with an attack or bombard to finish off the freshly wounded unit. In this strategy you are again going for a strong initial attack to quickly eliminate a unit. This gives you the advantage of more units plus it puts worthless cards in their deck. The cards you select here are a leader and 4 unit cards. The idea is that the hand gives you the ability to put together a multi-unit attack with the help of a leader. 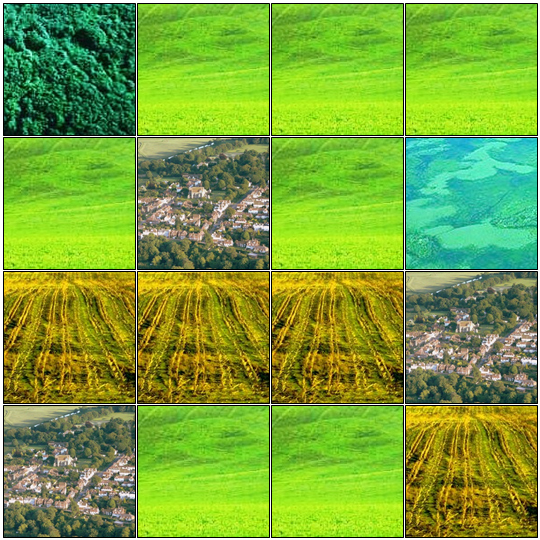 The unit cards could be of two of each of two units or all different – just so long as the units are clumped together. This is my favorite start, but I would throw in one minor difference of adding a mobility card to your hand. Adding in the Supply or Forced March cards can help you move your forces into position more quickly. The Withdraw can either be used to spring the trap or as a contingency plan if things go bad. If you are the British or Americans you could grab your Spy to find out what your opponent has planned. I’ve also seen a ‘grab-five-bombard-cards-and-ditch-them-because-I-always-fail-those-rolls-anyway’ strategy. I’m sure there are others. What have you tried that works? You are in the presence of wargaming greatness. Really. Okay, maybe not. But perhaps you’re in the presence of gaming competency. And that’s probably enough for this post. Feel like you’re constantly sitting down to two-player wargames and losing badly? You’re in luck; I’m here to encourage you, dear reader, to switch things up a bit. Stop staring at the rules, trying to find a loophole. Quit complaining about how the dice are against you. Man (or woman) up and start winning some games. “But how?” you might be asking yourself. It’s simple. Stop reacting and start acting. This might seem a trivial piece of advice, but understood properly, it will make you a winner–in board games anyway. I find the wargamers who consistently win have two key talents. The first is that they are good at assessing the circumstances in the game at any given moment and acting in such a way that their opponents feel forced to respond directly. The second is that when they are pushed back on their heels a bit, they respond to pressure in a fashion that actually turns the tables on their opponent. These two strengths combined mean that their opponents feel increasingly stressed out as a game goes on, they make bad mistakes, and they eventually lose. Have a strategy and be willing to change it: Sitting down to a two-player game, it’s easy to spend a few moments looking at the setup and your resources in order to determine a certain path to pursue. Equally important is reassessing that strategy every turn. Ask yourself, “Is this still a viable path to victory? Does it need changing? Does it need to be abandoned?” Otherwise you end up sending good resources after bad. Example: In a recent game of Manoeuvre, I decided to make a hard drive for the left side of the map where there was some nice terrain. When my opponent occupied it first, I slowed down the tempo, stayed out of his range, built up a strong hand of cards, and took the positions from him. If you’re losing the initiative in one area, focus on another: This is not to say you should abandon certain areas of a game if you think you’re losing. But you need to be willing to accept setbacks in one area in order to make gains in another. Devoting some resources to another area of the board will force your opponent to consider it. He will start to doubt himself. Example: In Twilight Struggle, you as the U.S. player quickly realize you’re getting beat in the Middle East. Instead of throwing everything at the region, you accept that you can’t wrestle back total control for the time being. Instead, you shore up what gains you have made in the region and start quietly placing influence in another region, let’s say Africa. Now your opponent gets to divide his attention between his baby, the Middle East, and your push into Africa. “What’s he doing over there? Is there something I’m not seeing?” your opponent starts to think. Execute a riposte when you can: A riposte is a move in fencing. It’s an offensive attack delivered immediately after you successfully parry an opponent’s attack. The intent is basically to catch your opponent off guard because your response is so quick. Some gamers tend to be cautious people–they fend off an attack by their opponent, but they follow it up by moving very slowly. I find that the moment after a successful defense is exactly the right time to play a little fast and loose and take a risk. Execute a counter-attack, open up a new offensive somewhere. In short, double your opponent’s sense of frustration over his failed move by pushing him back on his heels a bit. Example: In the World at War series, I find that the best time to take new territory is immediately after beating off an opponent’s assault. Take out a few tank platoons, but then take a new position. Move closer to the objective. You get the drill. Got any tips of your own? I’d love to hear your comments! Volko Ruhnke‘s Wilderness War (2001, GMT) is a relatively simple game in terms of its rules, but at the same time it’s quite subtle in its gameplay. In fact, it’s the first game I ever set up and then stared at the board for an hour saying, “Okay, now what?” And there have been enough questions from newcomers to the game since its recent reprint that I thought it was worth cooking up a quick strategy guide for it. (If you’re looking for a post about the historicity of the game, head to this post; watch the sparks fly as folks argue about it at Board Game Geek.) Please note: This strategy guide focuses on the tournament Annus Mirabilis scenario, which is the most commonly played scenario. As the scenario opens, the French are in a pretty strong position. Your historical predecessors have already bloodied the British at Ohio Forks and Oswego and command and control problems have kept them from doing much damage to you, hence the +4 victory points in your favor. The majority of your forces are concentrated in Canada proper, particularly at Quebec and Montreal. In addition, you’ve got a smattering of weaker forces in the western part of the map around the Great Lakes and the Ohio Valley corridor. Last, the French have a pretty decent force holding down Louisbourg, a key fortress way up north in Nova Scotia. Facing you across the frontier is a medium-sized army at Halifax, the jumping off point for an assault against Louisbourg, some strong but scattered armies in the Hudson River/Lake Champlain corridor in the center of the map, and weak and scattered provincial forces in the West busy holding down a string of stockades. The key to this scenario is always keeping in mind that you start winning! If you can keep the British from making too many gains in the six hands of cards you two are about to play through, it’s all gravy. The other thing to keep in mind is that while the British will likely be receiving a lot of reinforcements and better leaders, almost your entire army is already on the map. King Louis and his buddies are done sending help to New France, and you need to fend for yourself from here on out. So this game is clearly not about defeating the British in huge pitched battles. Are your leaders better? Sure. But it’s ridiculously easy to get them killed in battle, so exposing great guys like Montcalm only when absolutely necessary is clearly important.This scenario is about fighting an orderly withdrawal while slowing down the British advance as much as possible and at the same time getting VPs through frontier raids. It’s a bit like running out the clock in a basketball or football game once you’re ahead. Hopefully this is what you'll be doing a lot of...hit and runs, etc. In the opening hand, it’s usually best to do what the French did historically and come howling south toward Hudson Carry North with Montcalm. The small garrison there means you will likely a) besiege it and easily take the fort or b) force the British to destroy the fort and retreat. This will earn you 1 VP and make it much harder for the British to head north toward Montreal later in the game. It’s also a pretty sure thing if you move quickly, because there are no strong British leaders in the area. After that, it’s time to start striking poorly defended settlements along the frontier. Ohio Forks is a great place to launch raids from, but don’t neglect the open spaces on the eastern seaboard either! Remember that each raid nets you 1/2 VP at the end of the year rounded up, so you’ll need to stage three successful raids to earn 2 VP. This can be difficult to do especially against militia, but every battle you fight where you damage the militia is a victory of sorts. Use Indian Alliance cards to restore your losses and you’re golden. The British player usually isn’t able to move with any sort of speed and he’ll be telegraphing his moves once he starts building supply lines. Knowing when to stand and fight and when to run is crucial here. Sometimes it is possible to spoil an advance by swinging behind his main force and destroying his supply line. Another tactic is to leave a small leader with a good tactics rating and a clump of auxiliaries to act as a “speed bump.” The force might get wiped out, but you might also be able to knock off enough strength points from the British force to shift them one more column left on the CRT. A clever British player will move along more than one avenue of advance at once; I think it’s often best in this case to pick which corridor to commit your forces to, as splitting them will usually result in defeat at both places. Another big question is what to do with Louisbourg. You’ll want to keep spoiler cards like Fieldworks and Foul Weather for a push against this fortress. However, I think it’s wise not to place too large a force there, as you can’t retreat from the space and thus losing there will greatly cripple your army. Also, if you’re looking for more strategies to try out, you may want to read some reports of the World Boardgaming Championships final rounds: interesting stuff there. What I like about these numbers is the percentage of U.S. wins! They are generally considered a bit more challenging to play, and this used to be even more true with the older version of the game, which is what we played up until late last year. On the other hand, it’s quite clear that I am not so hot playing the U.S.S.R. Another note on this is that most of my Russian wins came when I was playing against a less experienced player. This brings us back to last night’s game. When we sat down, I specifically requested to play the forces of Communism, as I wanted to learn more about how to play them. With the exception of a few bonehead plays, I thought during the game that I wasn’t doing too poorly. However, it still wasn’t enough to stop Joe from winning on turn 9 after locking up Asia. Once we ended, we started talking over the game and then it dawned on me: I had been playing the wrong side. I let several key opportunities to coup on the first action round and deny Joe military ops slide by. I scattered my influence in several non-battleground countries. Worst of all, I got into a few fights in which I threw more and more influence at a region, hoping to outspend my opponent, not realizing he had far more high-value cards. Lulled into a sense of complacency by my previous successes as a U.S. player, I played like the other side (though the board and the cards were screaming otherwise) and lost. The lessons for the evening? First, when playing a game with asymmetric sides, try to play them an equal number of times so you’re competent at all of them. Second, have a clear idea about the strengths, weaknesses, and common strategies for the side you’re playing so you don’t look like a fool out there. Third (humorous) lesson: Take the opportunity to ditch CIA Created when you can. I had a shot, did something else, and spent turns 3-9 holding onto that baby. Man I hate the CIA. Don’t throw good cards after bad: Perhaps one of us should have stopped hurling colonial troops at Boston after the first defeat. Definitely after the second battle, when Howe inflicted maximum casualties on Washington’s army. Doing “more of the same” gets troops killed in an unnecessary fashion. Final count after three assaults on Boston: Brits lose 2 troops, Americans lose 7. Armies have multiple uses: Sure we like duking it out, but that’s not really the point of the game, is it? Armies can anchor vulnerable lines of political control markers or threaten territories an opponent would have otherwise considered safe. Each army is a “force-in-being,” that is, if it is on the board, the opponent has to stress out over it a bit, and sometimes that’s enough. For example: the British landing Cornwallis in Maryland on turn one forced the Americans to defend the Congress in Philadelphia by raising an army there. Conrwallis never attacked, but slowly made his way up the coast, taking MD and DE away from American control. Act, don’t always react: Almost every move the Americans made was in response to something the British had done earlier. Had the Americans raised a force in the south, say placing a small army in Georgia, they could have taken the initiative and forced the British to do a bit of reacting. Instead, the Americans reacted to Cornwallis landing in MD by raising an army in Philly (when perhaps dispersing the Congress might have been a better long term strategy). They reacted to Carleton coming into NY by moving Gates out of RI. They reacted to Clinton landing in NY by raising more troops in MA. Sometimes such reactions are necessary. Perhaps even in two of these three situations a reaction was necessary. But certainly not in all of these cases. End a turn ready for the next turn: This is one I often have trouble with. If an army ends its turn on an enemy-controlled space, it flips to friendly control at the end of the turn. It’s basically a free PC action. This, I have found, is what wins games. Similarly, one can never be too cautious when ending a turn. Our game ended on the first card play of 1777. The British played a minor campaign, used a small force to block off Washington’s retreat, then maneuvered a large force to crush him. Result: army destroyed, Washington captured, the American player cedes the game. Had the American player moved Washington to a decent winter quarters space late in 1776, this would not have happened (too many escape routes to block). Try something new: This is what keeps me coming back to particular boardgames–the knowledge that there is always another strategy to try. I think this is particularly true in Washington’s War, where the interactions between the war and the politics offer endless possibilities. In this most recent game, the British player purposely avoided his usual strategy (which involves landing troops in the south right away and working up the coast) and tried something new (landing Cornwallis in MD). It ended up successful, though who knows if that will happen again. Just a few thoughts after this very strange session of Washington’s War. If you want more details on the game itself, check out our Twitter feed for the play-by-play.